A recent study by the British Chambers of Commerce (BCC) found a quarter of businesses had not heard of Making Tax Digital, a legislation change that will affect businesses with a turnover which exceeds the VAT threshold of £85,000. The legislation will come into force on Monday 1 April 2019. 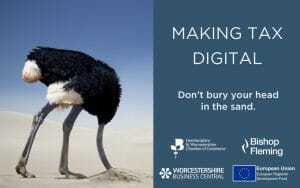 To help firms ensure that their business is compliant with the new legislation, Herefordshire & Worcestershire Chamber of Commerce is hosting a Making Tax Digital event on Thursday 13 December at the Chateau Impney in Droitwich from 7.30-9.30am. This event will be hosted by the Chamber in partnership with Worcestershire Business Central and Bishop Fleming.Local businesses have repeatedly expressed concerns regarding the introduction of Making Tax Digital and have suggested that they feel unprepared for the imminent legislative change. The event will therefore provide businesses with information regarding the software that they will need to become compliant with the new legislation. The event will also feature a speaker from Bishop Fleming, who provide accounting, tax and business consultancy in the UK, across the West Midlands and South West. Businesses will also be able to hear from a VAT expert on these mandatory changes, and will receive a free report detailing how it will affect your firm. Making Tax Digital compliant software suppliers will exhibit at this event to allow businesses to discuss their future options with software providers. If you want to know how to become compliant and what Making Tax Digital means for your business, come along to our free event to learn more. If you have any questions about the event or would like to find out more information, please email Poppy Bramford, Policy Executive, at policy@hwchamber.co.uk.